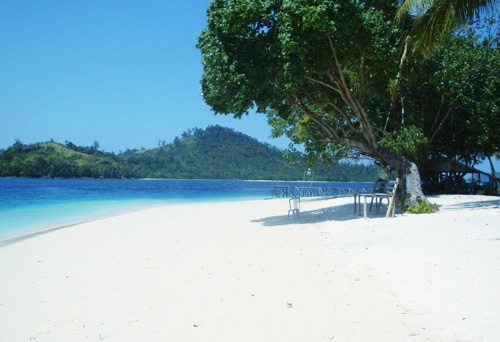 This beach is about a three-hour drive along the highway to the west of Jakarta, and has a great beach for swimming, as the waters are relatively calm on this side of the island. A great place for swimming, scuba diving, snorkeling, sailing, fishing, and underwater photography, this resort offers a complete set of facilities including restaurants, accommodation, motorboats, and diving equipments. This beach is located in West Banten, Labuhan district, Padeglang regency, which is accessible by any land transportation and takes about 3 hours drive from Jakarta. The parlous state of conservation in Indonesia, and in Java in particular means that this small, degraded forest behind this busy beach resort is one of the best places to find some of Java's lowland endemics. The forest has heavily used both by tourists (more high school students) and by local woodcutters and trappers. All the forest on the ridge tops appears to have been recently logged and this forest would appear to have a limited future - another victim of Indonesia's economic woes. Besides white beaches behind hundreds of swaying coconut trees, one panoramic highlight is the visibility of the infamous Krakatoa Volcano from Carita, rising above the horizon in Sunda Strait between Java and Sumatra. The visitors won't have difficulties finding a place to stay here as many cottages, hotels and camping grounds are all available, not to mention the inevitable seafood. Accessible from Jakarta over a fair road, the visitors can reach it in less than 3 hours, one third of which is over a toll road, which is being extended to the extreme western part of Java in Merak. Here again, most visitors arrive from Jakarta, as Bandung is more than 6 hours away from Carita by road.